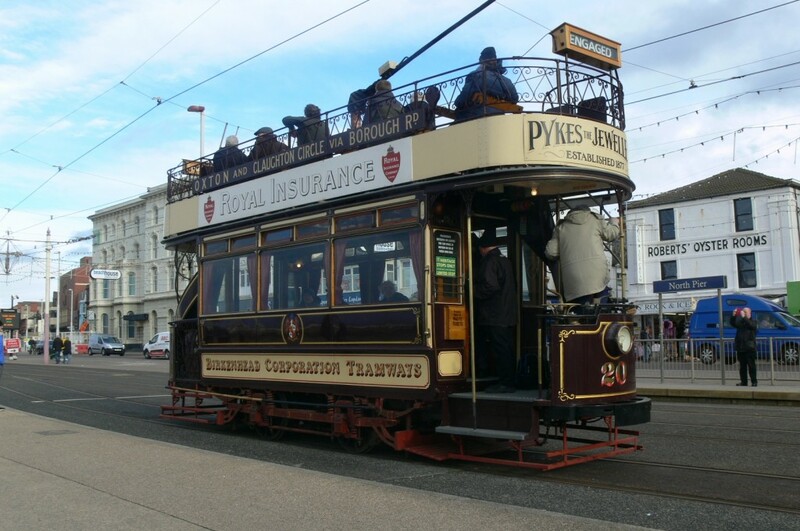 On Wednesday 7th November, the British Trams Online tour of the Blackpool tramway took place, taking two very different trams around the coastal system. This acted as a farewell trip for Birkenhead 20 which was making its final appearance before heading home to the Wirral, whilst illuminated Trawler 737 was also used to offer a full system tour to participants. Having sponsored the loan of Birkenhead 20 to Blackpool, we were able to take this delightful little tram for our very own tour – and what a fantastic tour it was! Departing from Rigby Road depot at noon in surprisingly fine weather considering the time of year, the tram was posed for photographic opportunities at North Pier, Cabin and Bispham before reversing and returning south. After a further photo stop at the Cabin, the heavens opened with a vengeance, resulting in the brave passengers upstairs getting a soaking on the final leg of this southbound run! At Pleasure Beach, and after yet more photos, everyone attempted to cram on the lower deck which made for a rather snug riding experience! Following a request from a passenger and a vote amongst all present, the second northbound run was curtailed at Cabin; this being done as this was the only time the car had ever reversed at this location with passengers on board. It was then back to Pleasure Beach and Foxhall, before heading back to the depot for a short break, and to enable our dedicated crew a chance to dry off! 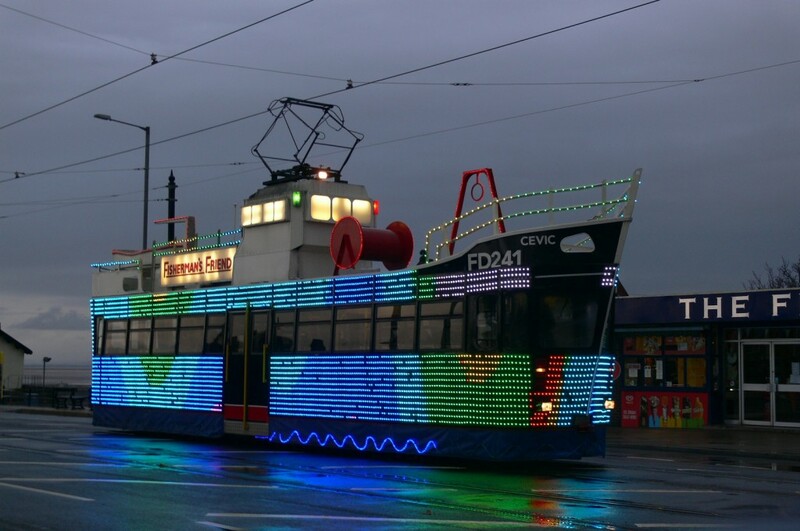 The second leg of the tour featured the illuminated Trawler 737 and once on the promenade, the tram reversed at Foxhall before running ‘stern first’ to Starr Gate – rare territory for an illuminated car in the light rail era. The tram then performed a full length run to Fleetwood in failing light, and after being posed for the cameras at the old loading stop alongside the Ferry cafe, the remaining passengers re-boarded the car on Pharos Street for the run back to Rigby Road, with several of our guests choosing to leave en route. We charged our guests £10 for this tour, with all proceeds being donated to the Fylde Tramway Society’s appeal for funding to restore open top Balloon ‘Princess Alice’ 706 to operational condition. With fares from 22 passengers combined with a further collection during the tour, an incredible total of £453.50 was raised for the appeal – a massive thank-you to everyone who supported the tour and those who donated so generously. Considering that the tour was held on a weekday in November and we not able to give much notice, this was a fantastic response which made all the efforts made to organise the day worthwhile. Grateful thanks also go to our intrepid crew for braving some challenging weather conditions and adding to the occasion by indulging us and helping to provide some excellent photo opportunities and rare moves! Birkenhead 20 is expected to be prepared for its journey by road to Birkenhead imminently, having operated with passengers just five times since its arrival in Blackpool back in July 2017. This was certainly not what we had hoped for – indeed, the main purpose of the loan deal was to provide the heritage operation with a useful open-top tram for public tours in the peak summer season. For various reasons this was not to be, but we are at least happy that 20 did eventually operate to bring pleasure to some, and its visit to the seaside also enabled it to receive new tyres which will benefit this magnificent tramcar for many years ahead. More photos of 20 and 737 from this tour will appear on the website in the near future. The first of numerous photo stops for Birkenhead 20 on its tour for British Trams Online on 7th November, at the Tower/North Pier heritage stop heading north. This entry was posted in Blackpool Tramway. Bookmark the permalink.